The second month of the year offers productive opportunities to plan for future success. February is one of those months that many anglers have a love-hate relationship with, which seems almost fitting with Valentine’s Day falling at its mid-point. There are times I’m grateful the second month is the shortest of the year, and then there are moments that make me wish I could freeze frame time. It all depends on the prevailing conditions. From an early taste of spring to downright frigid temperatures and everything in between, February can produce all of the above in its brief 28 day stretch. The affects of this consistently inconsistent pattern can be seen in the behavior of the salty species pursued. It’s a yo-yo like transition with plenty of ups and downs. Anglers that make plans according to the current conditions can find on the water success for a variety of species, as well learn valuable information about the waters they target will be helpful in the coming spring months. One approach that will result in consistent action is to simply fish for what’s biting. 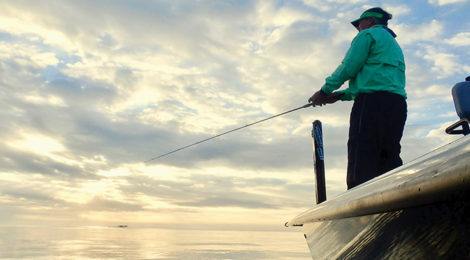 Speckled trout and redfish always seem to be in the spotlight, but situations during this transition period don’t always lend themselves towards catching numbers when it comes to targeting these highly sought after gamefish. Luckily, there are plenty of other species that can produce bent rods, new memories, and piles of fillets.